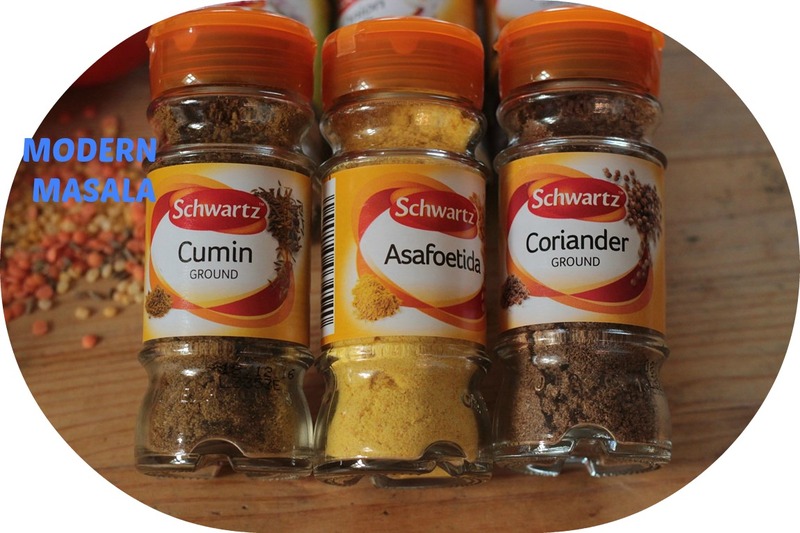 In 2014, global flavour leader McCormick, parent company of leading herbs and spices brand Schwartz, is celebrating its 125th anniversary. The yearlong celebration kicks off with the launch of the 125th Anniversary Edition of the Flavour Forecast (a new, annual prediction of what ‘flavours’ will be most popular in the cooking world) and the Flavour of Together programme, with the goal of connecting people around the world as they share 1.25 million stories about the special role food and flavour plays in our lives through. 1. Chillies Obsession: Food lovers everywhere are seeking out their next big chilli thrill. 2. Modern Masala: Indian food is finally having its moment, breaking free of its traditional confines with modern interpretations. 3. Clever Compact Cooking: Proving that big flavours can come from small spaces, cooks in urban kitchens are making the most of what’s available. 4. Mexican World Tour: Mexican flavours are making their way around the globe, with people everywhere discovering new aspects of this bright, casual cuisine. 5. Charmed by Brazil: The world’s attraction to Brazilian cuisine is heating up, thanks to its seductive mix of global and native influences. 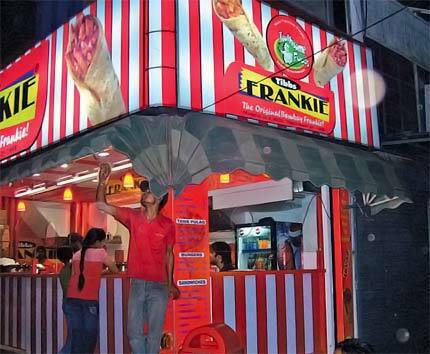 I decide to take up Modern Masala as a flavour trend. 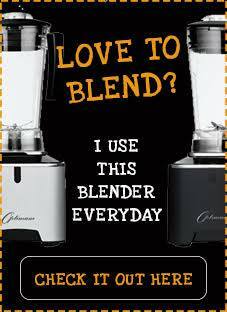 Coming from India , using a complex mix of spices as part of our daily diet has always been a part of my life. The beautiful large open fruit n vegetable markets even in major cities are a visual treat and there is a lot of passion involved in say getting the right type of chilli powder. So I think my recipe is an amalgamation of these two big flavour trends together – Chillies Obsession and Modern Masala and of course because I manage all my culinary experiments in my tiny urban kitchen which is the size of a postage stamp I am sure my recipe also covers the theme Clever Compact Cooking! 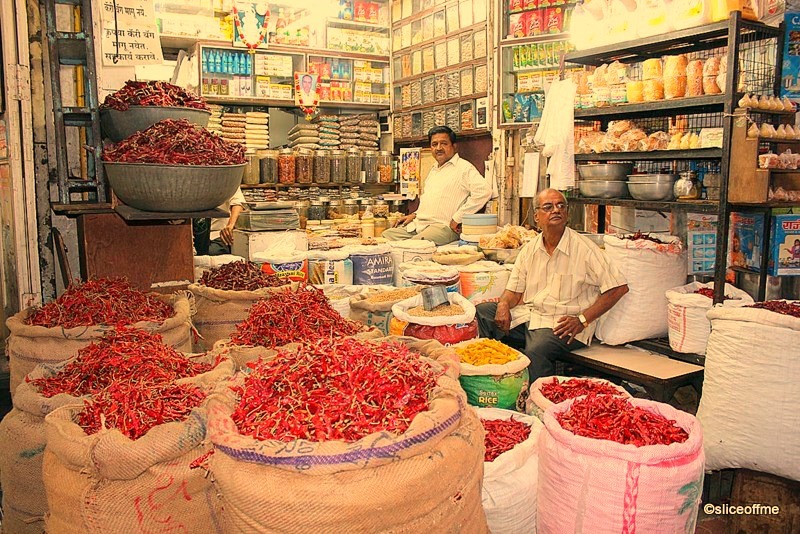 My most vivid memory of spices being sold loose is of this huge wholesale and retail market in an area called Parel , Mumbai in India.There are many tiny shops and vendors which hand carts with huge piles of spices , bright red chillies in jute sacks and mini yellow mountains of turmeric and ever imaginable spice being sold in the open.Of course with our modern industries being so well developed we always used masalas out of a packet but the sheer variety available locally in any small town in India is mind boggling. In London I trudge to my local Indian shop and bulk buy the packets and secretly wish I could get an unlimited supply of aai’s home made garam masala and red chilli powder where she carefully selects 2 types of chillies with varying degrees of heat and roasts them in a kadhai after they have been dried in the blistering hot afternoon sun! 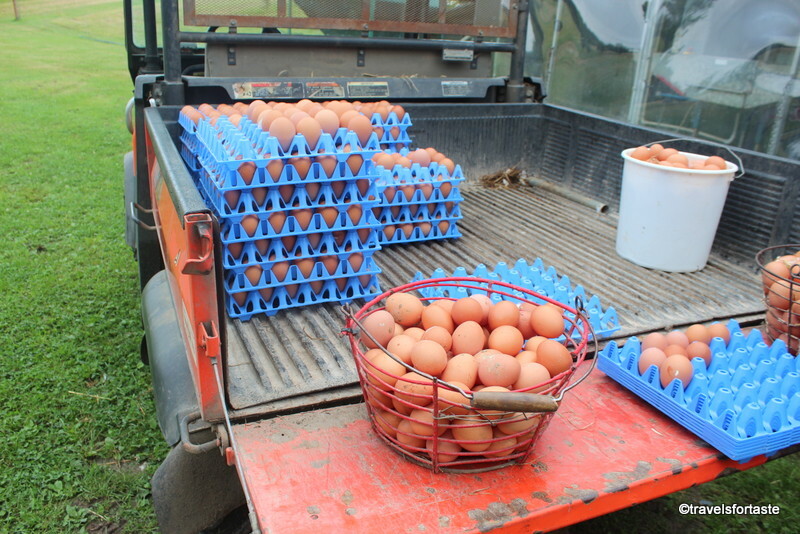 Then she takes it to a local mill where it is ground and packed into a large ceramic jar and then stored at home. I have made a simplified version of Tibbs Frankie using boneless mutton and a variety of Schwartz spices which were sent to me.You could safely say that this fella ”Frankie” is a distant cousin of the Fajita and the Kathi Roll.How this Frankie came into being is also a very interesting story which I shall share in a few lines here. 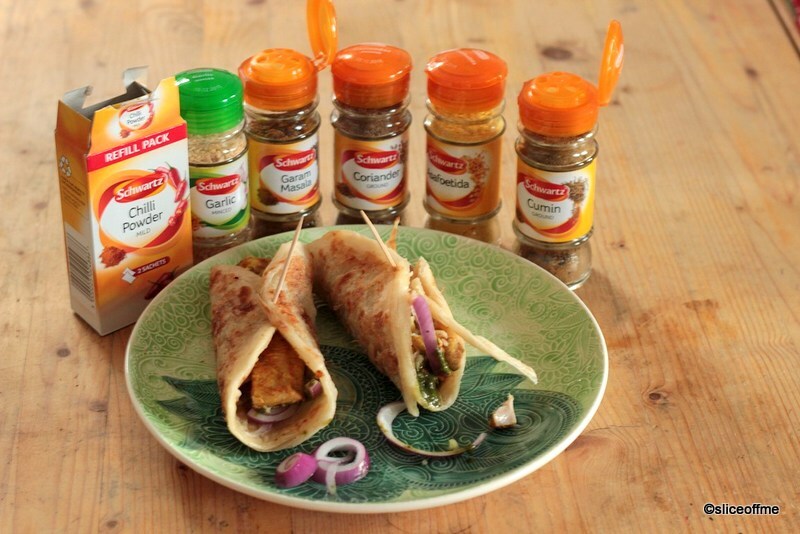 I have created what is my version of a tawa chicken roll (tawa meaning pan in Hindi), the original Tibbs frankie filling is a tangy spicy taste which they attribute to a secret ”Frankie Masala” – humm , well I think I got pretty close 😉 – evil laugh follows 🙂 You can go crazy and creative with the fillings and use this recipe idea to use up meat from your sunday roast, try various different veg and non veg patties with meat and masalas rolled into boiled potato casing and shallow fried. Great way to use a lot of colorful veggies and create a stir fry filling too – the possibilities are endless. 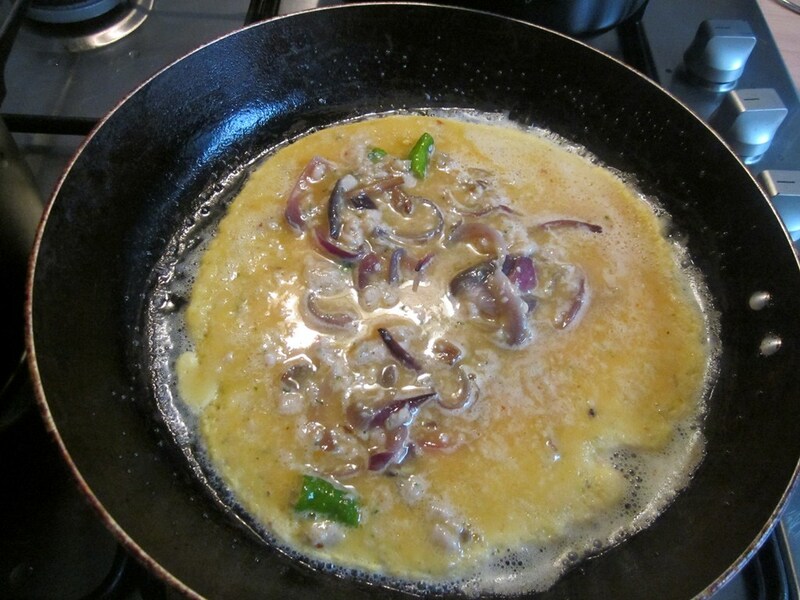 Heat a saucepan on medium heat and add the oil, when it is hot add the asafoetida, split green chilli and crushed bit if fresh ginger ,saute’ and add the garlic granules, when the garlic begins to give out a strong fried aroma its time to add the finely chopped red onion. Cook the onion till it reduces and turns a delicious brown, then add the coriander and cumin powder and garam masala and mix well. Then add the finely chopped tomato and add very little water and cook for 1 -2 minutes without lid , stirring frequently, so as to ensure the mixture does not stick to the saucepan. 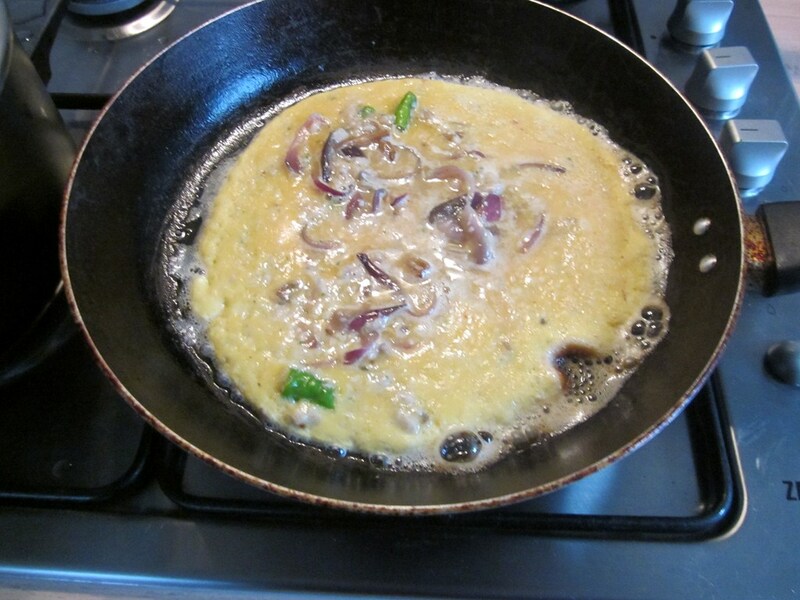 Now the spices have been thoroughly cooked along with the onion and tomato to make a thick gravy. Wash the coriander and mint leaves and spritz them in a food processor with the green chilli chopped – to reduce the heat use 1 chilli de-seeded.Add the salt and lime juice and spritz once again. 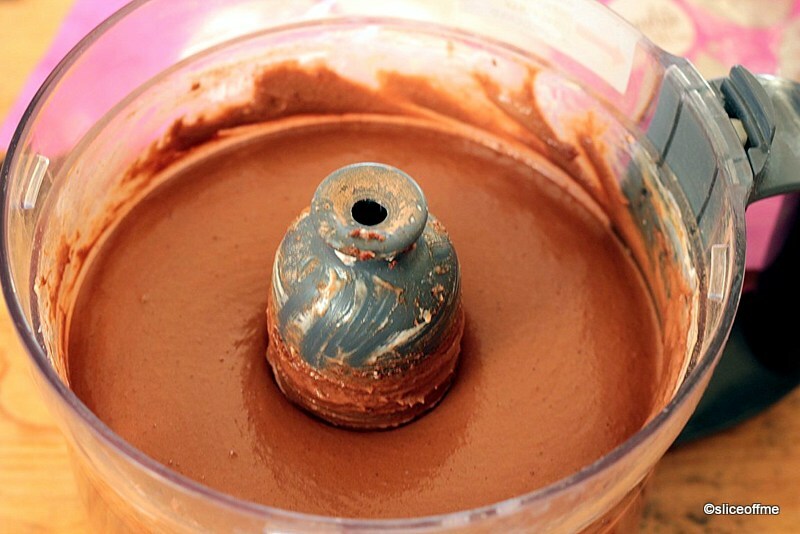 A smooth thick green paste is the consistency we are after – add some water to adjust the consistency. This chutney stores for upto 10 days in the freezer in a clean ,air tight jar – rarely lasts that much in my house though – love making Bombay sandwich for dinner ummm. 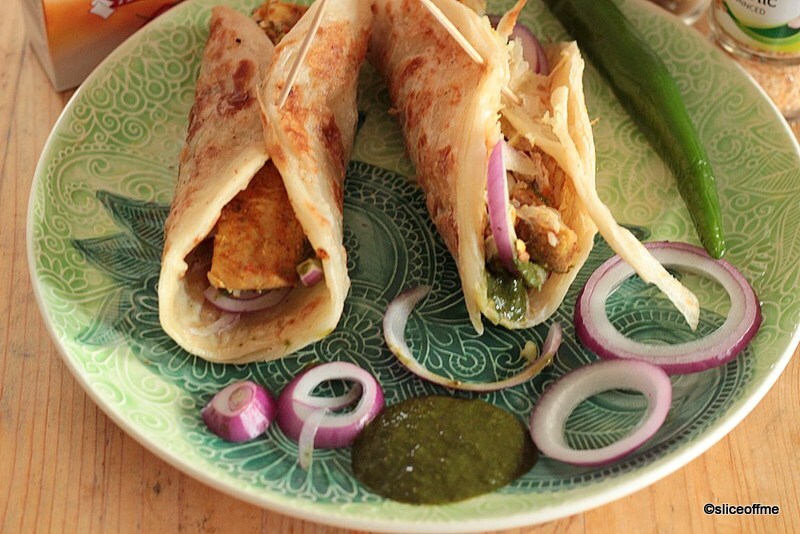 Once the paratha coated with egg has been cooked on both sides on a pan slather it with the mint and coriander chutney and add some red onion chopped lengthwise. Add a generous helping of the chicken filling , roll and wrap one end with some kitchen foil or baking paper .Enjoy hot. 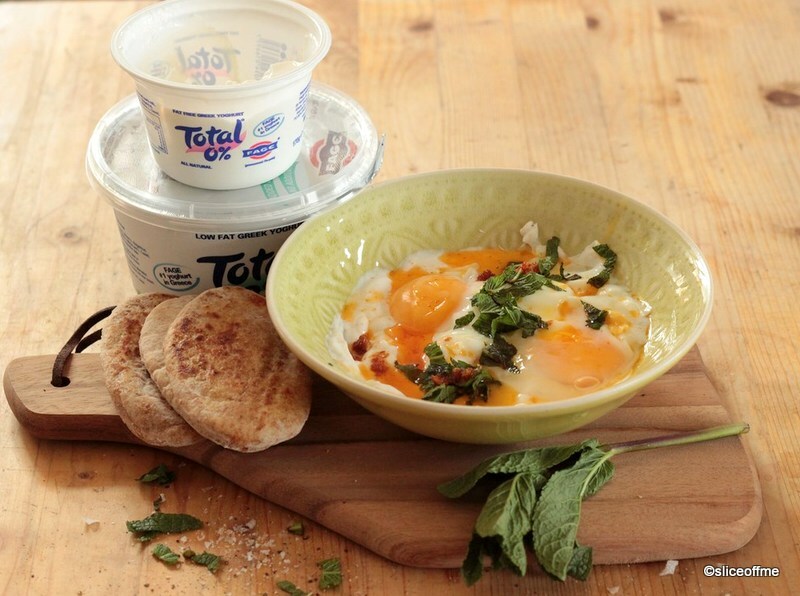 Dip into the chutney or tomato ketchup as you munch along. The company has pledged to donate $1 to United Way Worldwide and it’s UK partner Focus on Food, for every story shared on the Schwartz website, Facebook page or other social channels. Disclaimer: I was sent samples of Schwartz by McCormick to create a dish and write a review and was also sent a generous voucher to compensate me for the ingredients.I was not required to write a positive review and was not compensated monetarily for this post.Like all my previous posts about events and reviews, ALL opinions expressed here are entirely my own. I was having a bit of ”Nigellisma” attack on Tuesday ,if thats possible!I have been planning on baking an indulgent and rich chocolate cake.Also after reading Ren’s post where prompted by Dom’s Random Recipes challenge,Ren baked a Vegan Chocolate Cake using a recipe for Affinities Cake from the book titled Rococo,, I asked my neighbours 5 year daughter to flip through Nigella Lawson’s book ”Feast” – Food That Celebrates Life, lucky for me she stopped at Nigella’s Old Fashioned Chocolate cake recipe ,made using only the food processor – so very perfect. 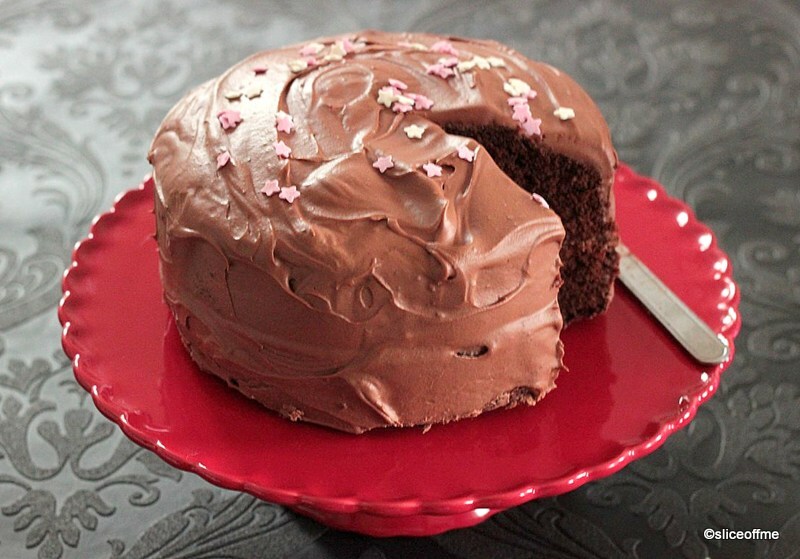 Besides no better way to bring in Valentines week than by baking a decadent chocolate cake with hints of coconut flavour and adding some coconut flavoured icing on the top.I love Nigellas original recipe which I have (dared to!) modify as I wanted to I had been thinking of ways to use the lovely samples sent to me by Sugar and Crumbs . I have modified the original recipe by using three medium sized regular eggs ,thick yogurt instead of sour cream, and have reduced the quantity of ingredients for the icing because I am not a big fan of slathering a very thick layer of sugary icing in between the layers nor am I very fond of a huge layer of icing on the top but I guess even after reducing the quantities of ingredients for the icing I still managed to get lots to smother the cake with.I have used Sugar and Crumbs flavoured cocoa powder in Chocolate Coconut and Sugar and Crumbs flavored natural icing sugar in coconut flavour, result – a perfectly balanced taste of coconut without being overpowering. 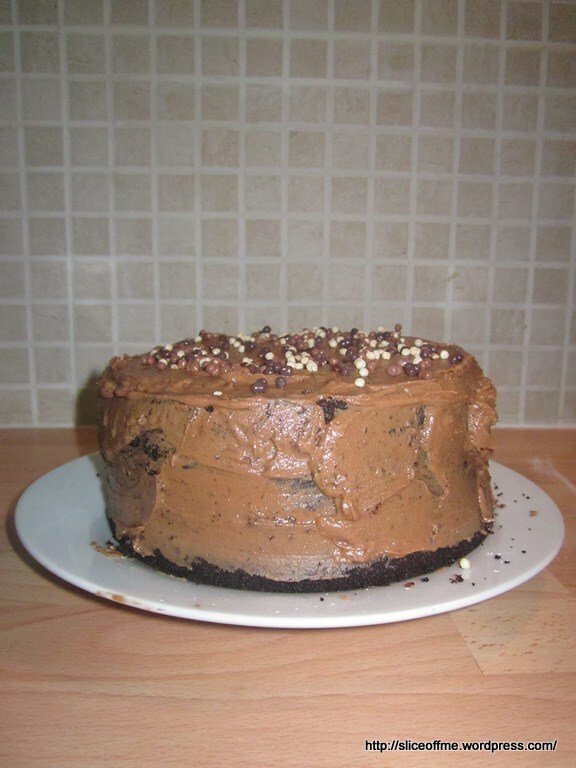 So am calling my cake – ”Chocolate Coconut Cake with Coconut flavoured Icing”.For the remaining part the original recipe is perfect, basic,simple and therefore beautiful as it is foolproof and even a novice can get an excellent delicious, fluffy and intensely chocolatey cake – very satisfying indeed! Thank You Nigella! 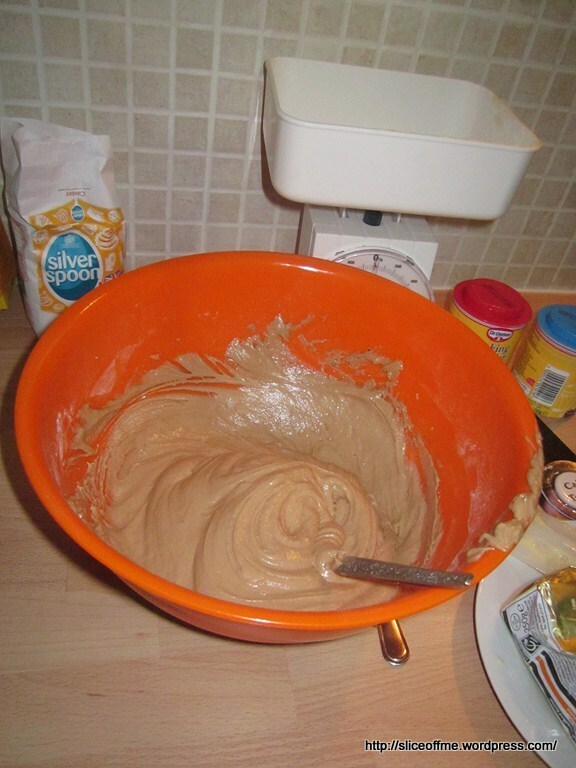 Sift the plain flour through a sieve into a large mixing bowl. 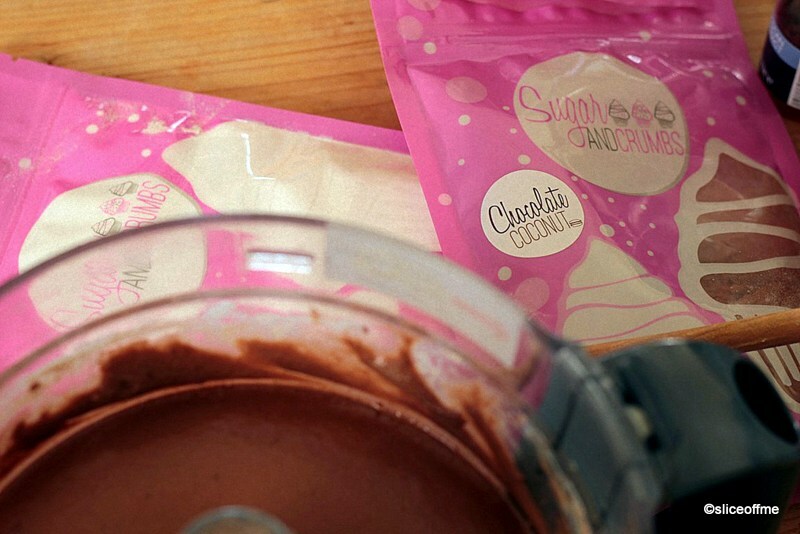 Add the caster sugar, cocoa powder, baking soda and bicarbonate of soda. 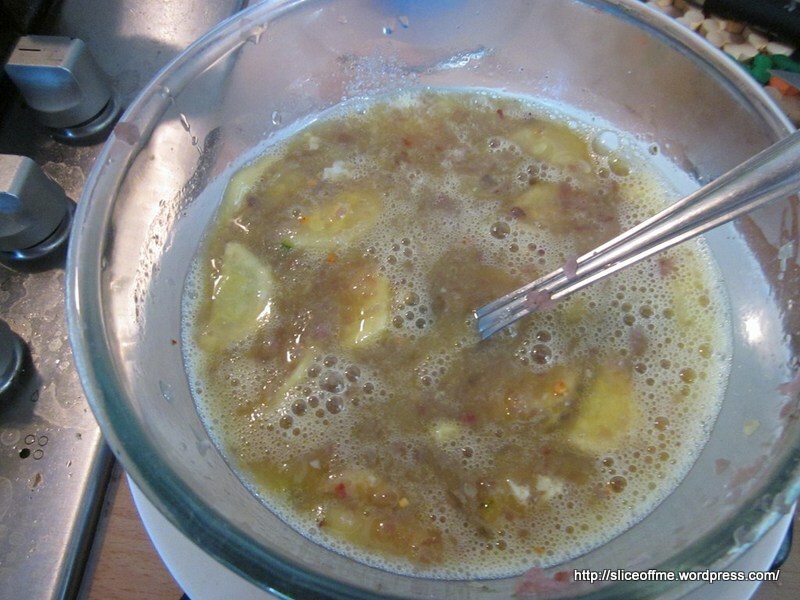 Mix well with a spatula and transfer into the food processor. After an initial spin , use the blunt edge of the knife to scoop out what stuck to the walls of the processor and mix well with the cake batter. Don’t worry if you think the batter is very thick ,another spin for about a minute should give you the required consistency to ”pour” into the cake tins. Grease two removable base 8 inch tins with butter and equally divide the cake batter into each tin. 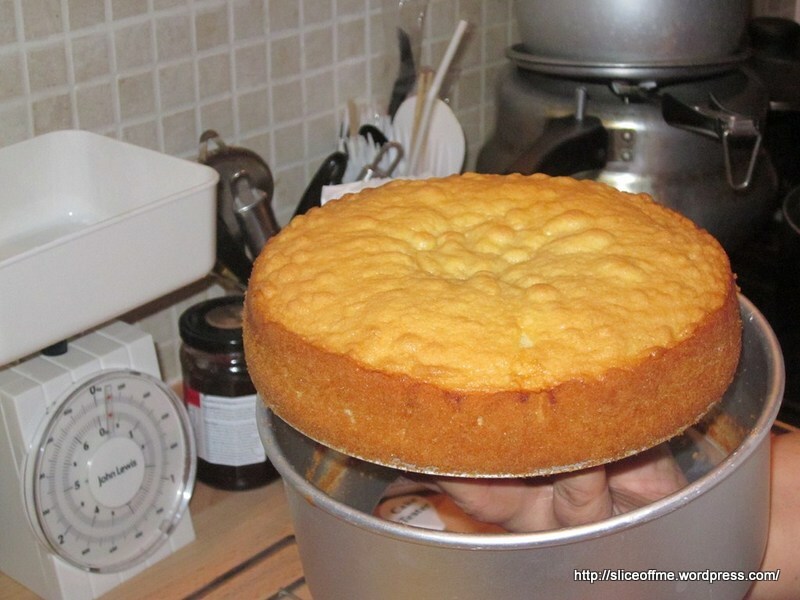 Bake for 25 minutes and then test the centre of the cake with a cake tester or thin skewer. 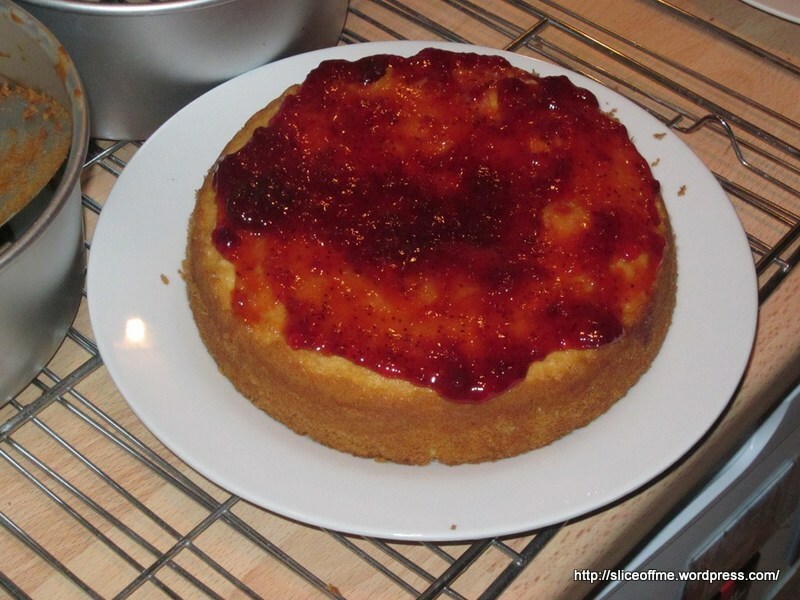 My cakes were done in 25 minutes but you may need up to 30 minutes depending on the type of oven. The cakes rose beautifully but the top had cracks. 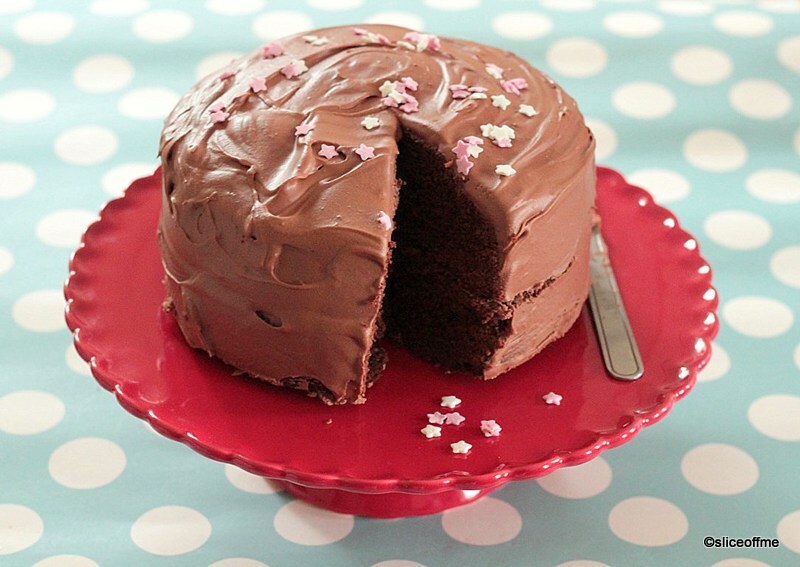 The icing was there to save the day and make the cake look pretty. 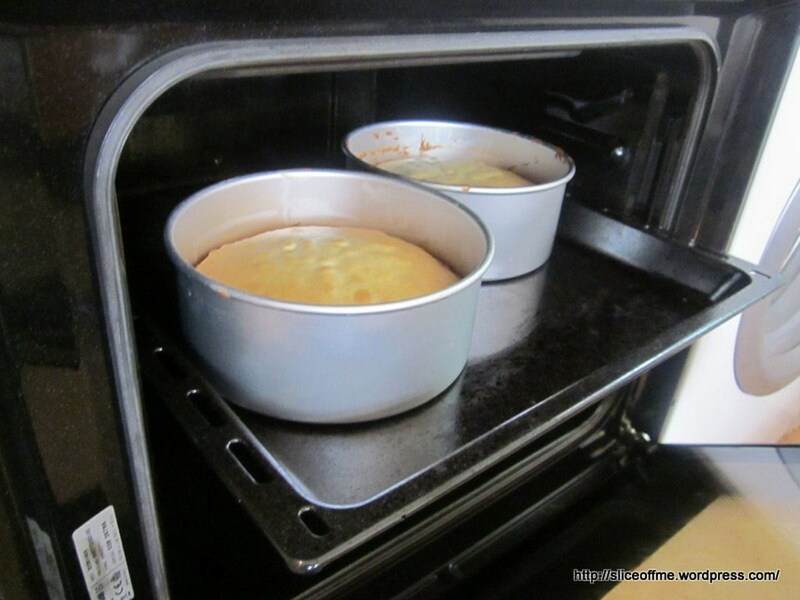 Remove cakes from baking tray and leave to cool down on a wire rack. Now to ice the cakes place the slightly domed part of one cake face down and slather icing on the flat part and place the other cake flat side down on the icing and then slather icing all over the cake. 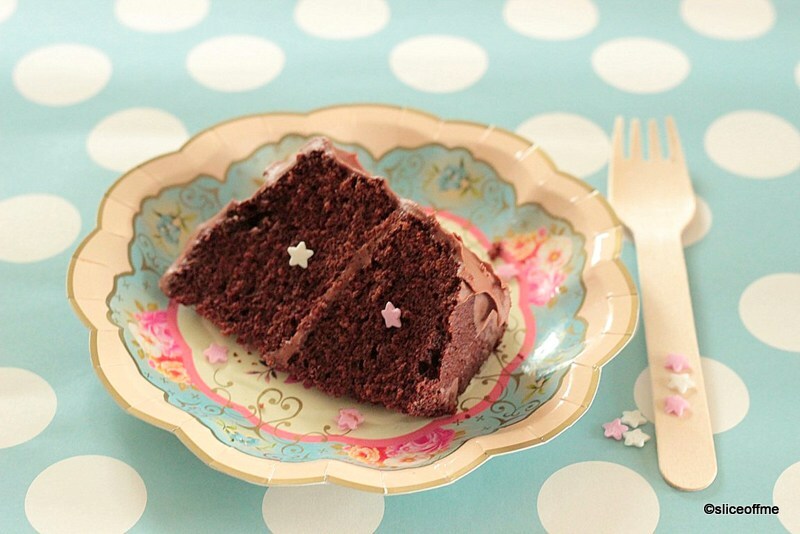 I had some pretty pink and white sugar stars which I used to decorate my cake. Happy Valentines Day – just realised its past midnight ! If like me you haven’t yet figured out what you can do for that special someone in your life ,maybe its time to send them a cute little surprise they can see through the day on their phone or email , something I haven’t done in a long long time, send an e-card! Greeting Games is a digital greeting card combined with a casual game. It’s a really fun way to send eCards to people, and the brilliant thing is it works on smartphones as it’s not Flash-based.The site, which works seamlessly on all devices from tablets to PCs and smart phones, also has greeting games for numerous other occasions including birthdays and “just for fun.”As the sender, you get to choose the occasion, choose the game and then tweak various options including adding a personal message to the recipient. After February 11, customers will be able to send up to two greeting games for free.Think of it if you will as a new way to communicate their love and affection with tailored casual games and in-game messages. 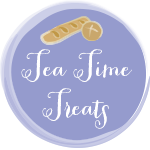 I have been meaning to link with the Tea Time Treats challenge hosted by Karen who blogs at Lavender and Lovage ,for sometime now, finally am getting around to doing just that.The theme for February is – you guessed it – CHOCOLATE! 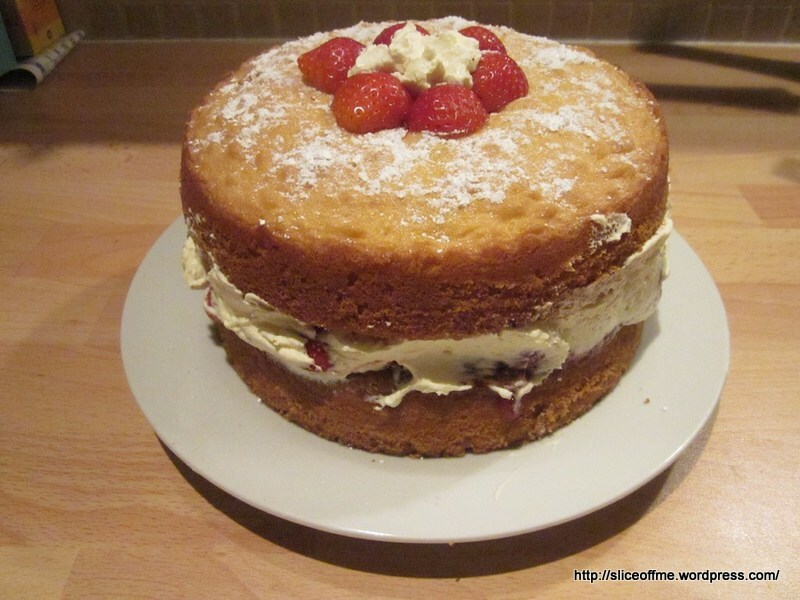 This cake is definitely gorgeous enough to be served as dessert and as a rather special tea time treat and with such a mega celebratory week for us I couldn’t think of anything more apt 🙂 This challenge is co-hosted on alternate months by my lovely blogger friend Jane who blogs at The Hedgecombers. Also linking to the We Should Cocoa event hosted by Choclette who blogs at Choc Log Blog where the challenge is to use an ingredient and that ingredient is chocolate – how apt for Valentines, and with all that gorgeous dark chocolate this cake certainly qualifies!This month, Dom has also joined forces with Choclette,result – two round ups at the end of the month instead of one and two great challenges linked to make one mega event– what fun! 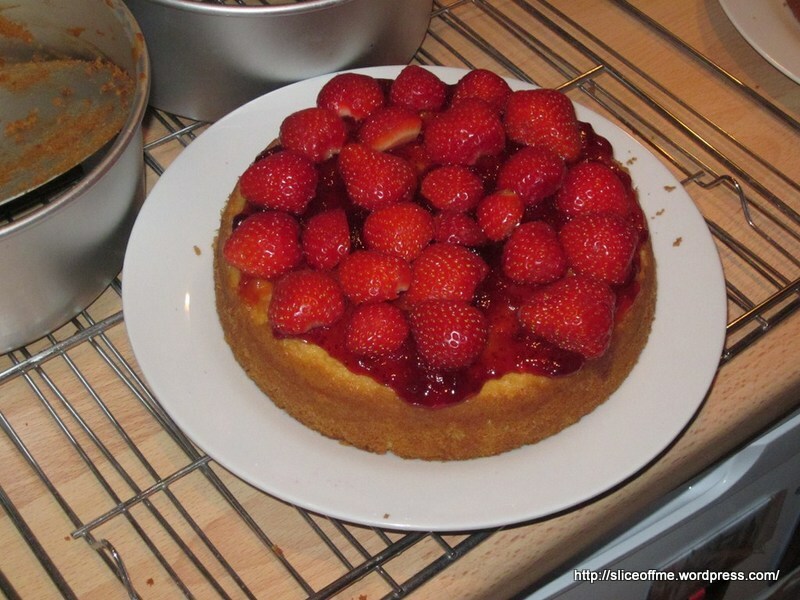 Another first – entry into Nayna of Simply Food’s Lets cook sweet treats for Valentine.Also for the first time. 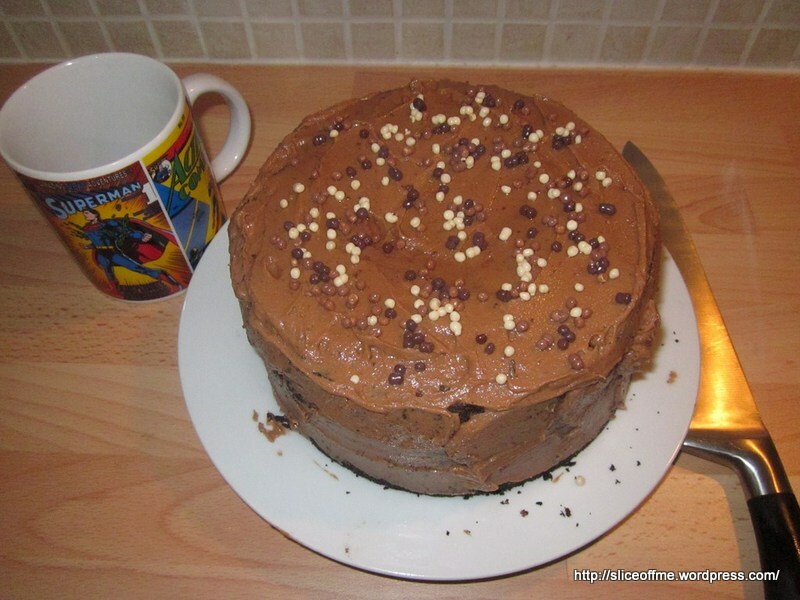 I’m joining in with Jibber Jabber’s Love Cake first ever event where the theme for the month of love BAKING WITH PASSION and this is a cake baking challenge. 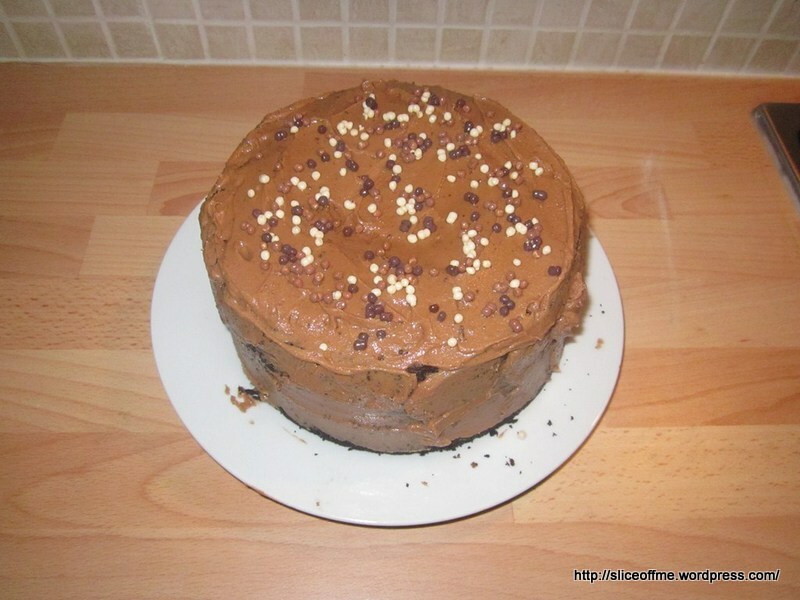 Since I did bake this cake on Tuesday am linking it with Anyonita’s Tasty Tuesday’s Blogging Party – ! 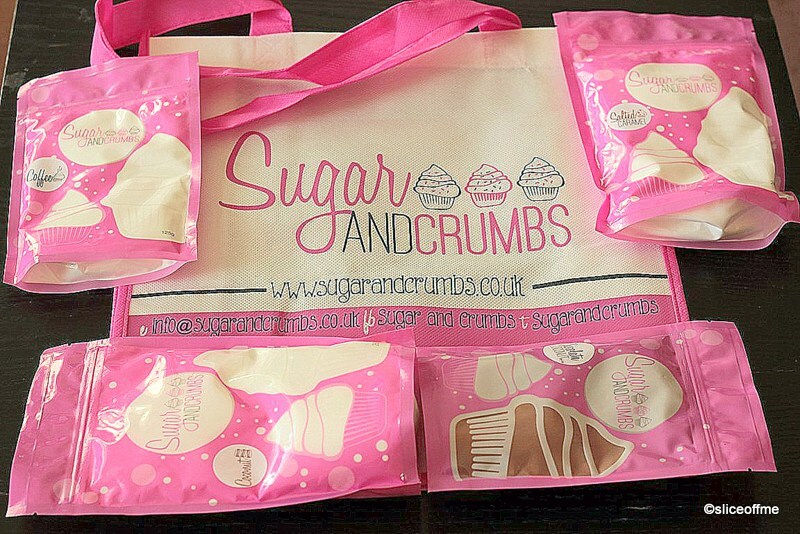 Disclaimer: With many thanks to Sugar and Crumbs for the generous amount of samples to test and review.I was not required to write a positive review and was not compensated monetarily for this post.Greeting Games has offered me a 2 month free subscription in exchange for supporting the launch of their e-card games.Like all my previous posts about events and reviews, ALL opinions expressed here are entirely my own. 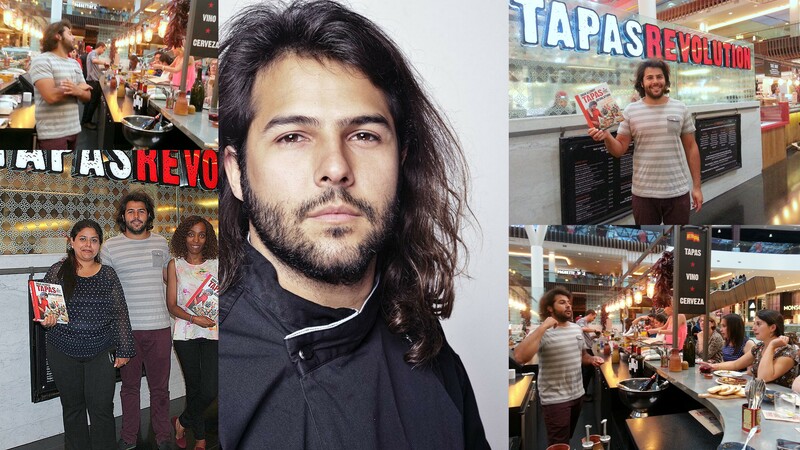 Excited that I would be meeting the young and talented Chef Omar Allibhoy at the Launch of his Book called Tapas Revolution at his Tapas bar by the same name I couldn’t wait to get myself to The Balcony at Westfield,Shepherd’s Bush. The district Line managed to live upto its reputation of being the most non trustworthy of all the tubes lines with delays and finally after 3 changes I managed to reach the venue! Gaah! 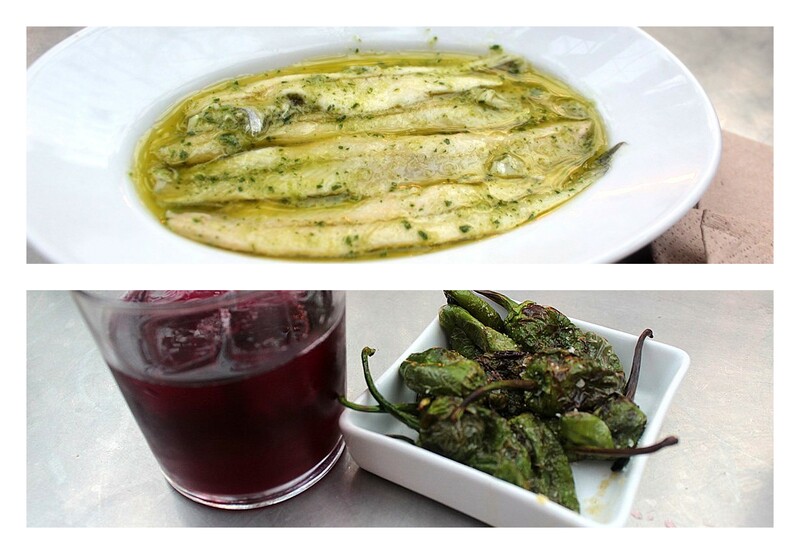 Any feelings of angst soon vanished when the I saw familiar faces at the Tapas Bar. 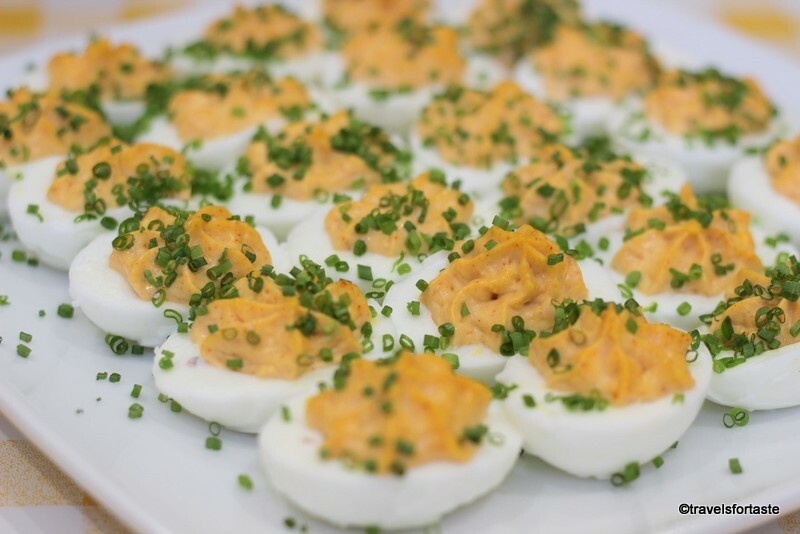 A few of the food bloggers I met at FBC’5 were there and as the evening progressed I met some more interesting foodies. It’s the best part of being a foodies, talking food with like-minded people and feeling totally normal discussing spices,ingredients, chefs and cookbooks, never a dry spell in conversation I say.In all we were a group of about ten to fifteen food bloggers invited to Chef Omar’s book launch – TAPAS REVOLUTION – 120 simple CLASSIC Spanish dishes. What followed was an evening of great food, lots of Sangria (for me), an insight into Spain’s rich culinary traditions and of course lots of picture-taking,posing for pictures and in my case eating some foods I have never dared to try until now! If one thing is apparent as I watch Chef Omar effortlessly dishing out one plateful of flavour after another is his passion for food. All of 29 this young man has taken it upon himself , a mission of sorts to revolutionize the Spanish Tapas and put them firmly on the U.K Map and as Tom Parker Bowles of the Mail on Sunday has said ”….with this talent,passion and dedication the revolution’s in good hands” and mind you all this and his Charm and good looks is a perfect combination for success! 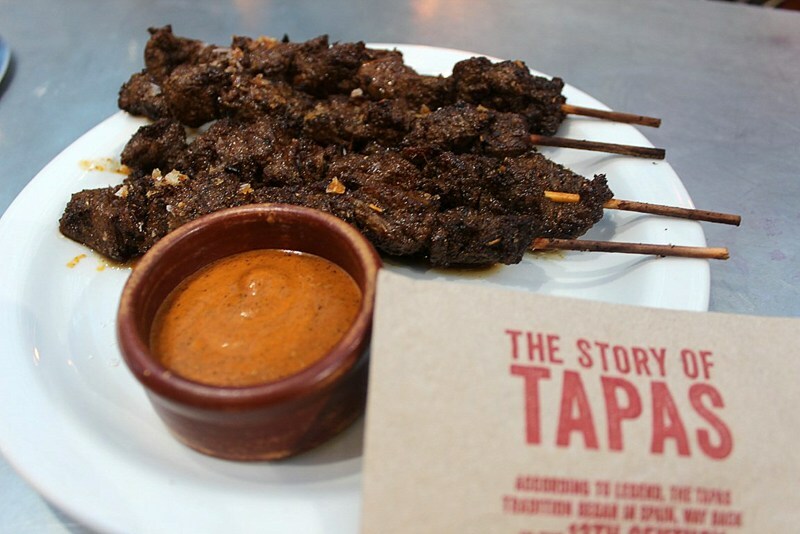 Lucky for us especially knowing the humble beginnings of Tapas which literally meant ‘tapa’ or ‘to cover’ and according one of the theories of their origin they were served free to cover one’s drink and save it from flies! Chef Omar and his cheerful team orchestrated the whole evening well ,after all not a mean task to serve 14 different dishes perfectly plated and all this while ensuring that our glasses never ran dry! Jamon (Ham) Ibe’rico – Ibe’rico ham gets its rich nutty flavour from the pigs that roam freely in the woodlands of Spain eating acorns and herbs. 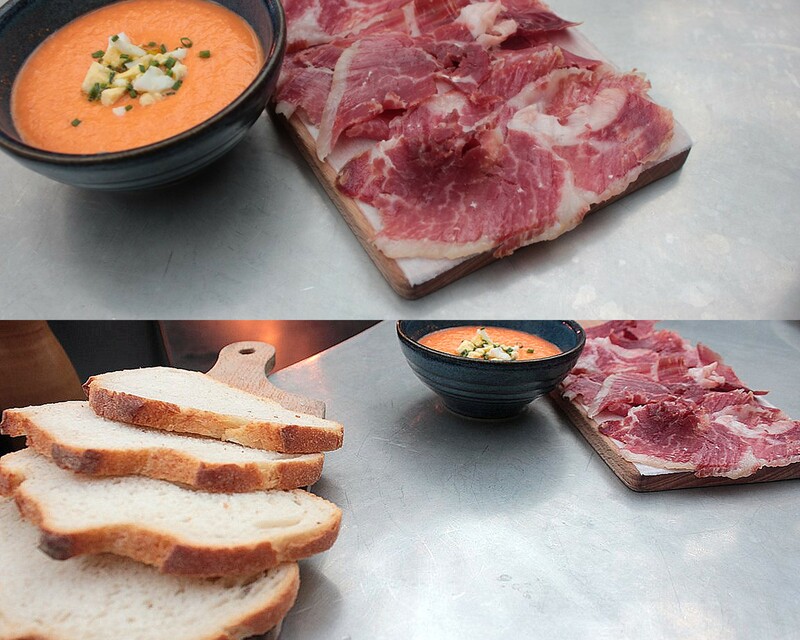 Salmorejo – Bread served with Chilled and divine Tomato dip called Salmorejo – a chilled tomato dip traditionally from Seville. I am not ashamed to admit that I wiped off every last drop of the Salmorejo dip off my plate and all this with a very innocent face and while making polite conversation;)This dip is very similar to the cold cucumber soup or Gazpacho because it is served chilled. 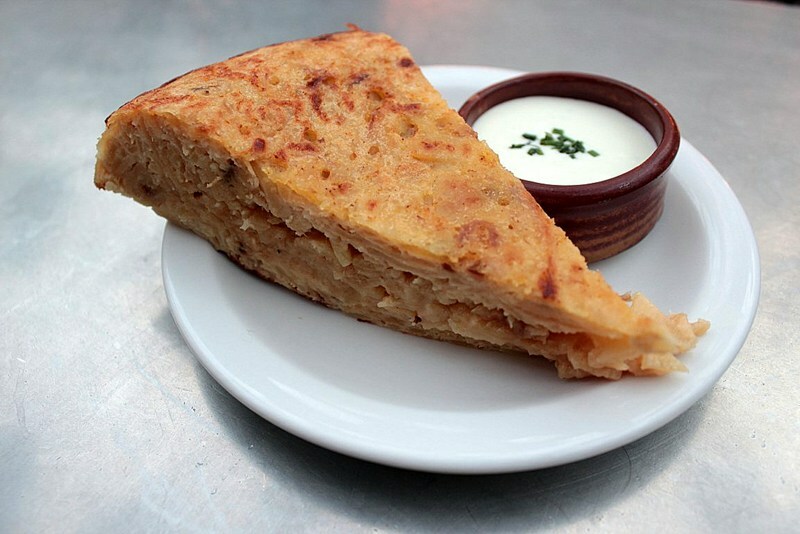 Tortilla De Patatas – Spanish Omlette with Charlotte Potatoes served with a dip called ALIOLI or Mayonnaise made with – get this MILK! Pulpo a la Gallega – Steamed octopus with potatoes and Pimenton – This dish looked so tempting that I happily ate it and only when I was home and typing this up did I realise that it’s the first time ever I have dared eat an Octopus after a singularly scary episode of eating one years ago and breaking out in a rash before I could blink, I have since steered clear of this delicacy to avoid turning into a puffer fish and scaring fellow diners away.But no any more, Tapas Rule woohoo! 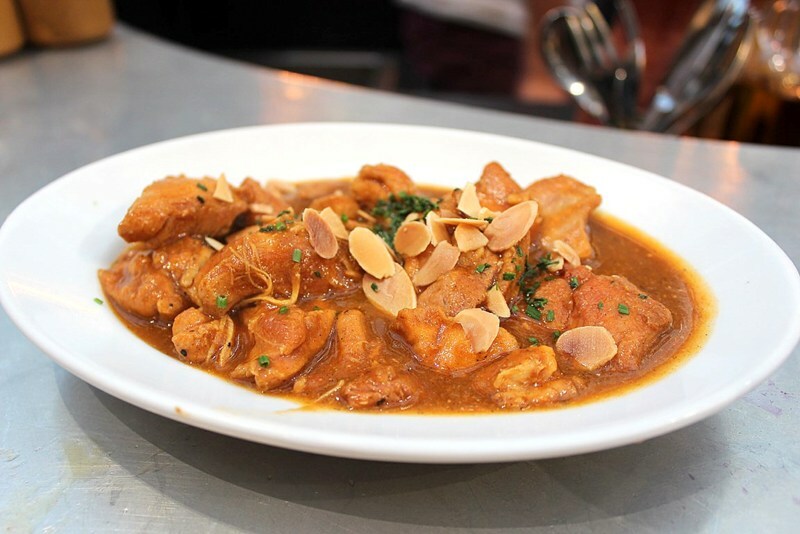 Pollo en pepitoria – Moorish Chicken. Chicken in saffron, cumin and vegetable sauce, honestly not my favourite but still great depth of taste because of the saffron and cumin together some notes of taste would be similar to that of an Indian curry but with many other levels of flavour. By now our gastronomic journey had traversed from simple to exotic in about 3 platefulls and this juicy beef skewer was supremely satisfying on all counts, the sea slat hits the palate after your teeth has sunk into the meat and the spices have enveloped your mouth in an avalanche of taste – this is my clear favourite and only the Tortilla and Alioli with its surprise ingredient – Milk manage to scrape their way in as close second favorites. Pinchos morunos con mojo picón – marinated beef skewers with a spicy dipping sauce.Everything about this dish including the dip was so perfect, I could eat this everyday and not get bored. 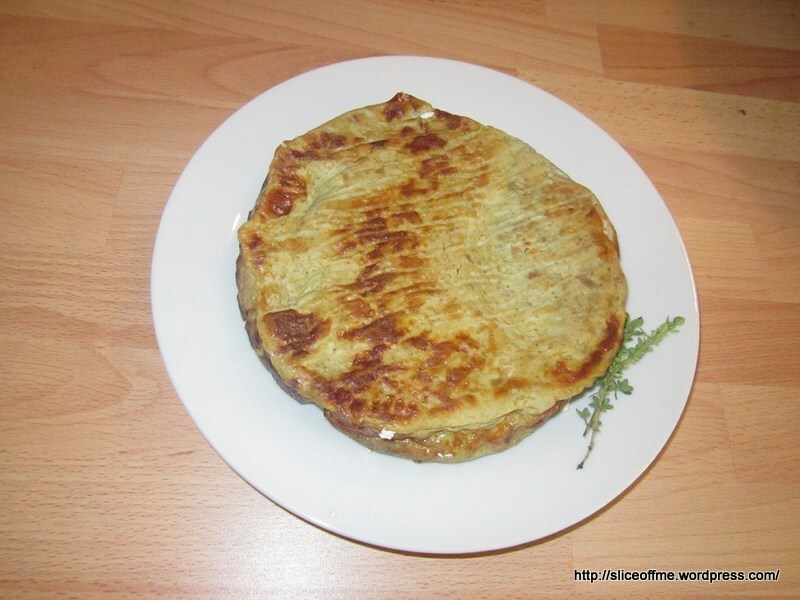 Papas Arrugadas Con Mojos – Wrinkled Potatoes with Mojo – This is the Chef’s hand me down family recipe and how they do potatoes in the Canary Islands, again another spectacular dip with coriander , very tasty and appealed a lot to my Indian taste buds a lot. 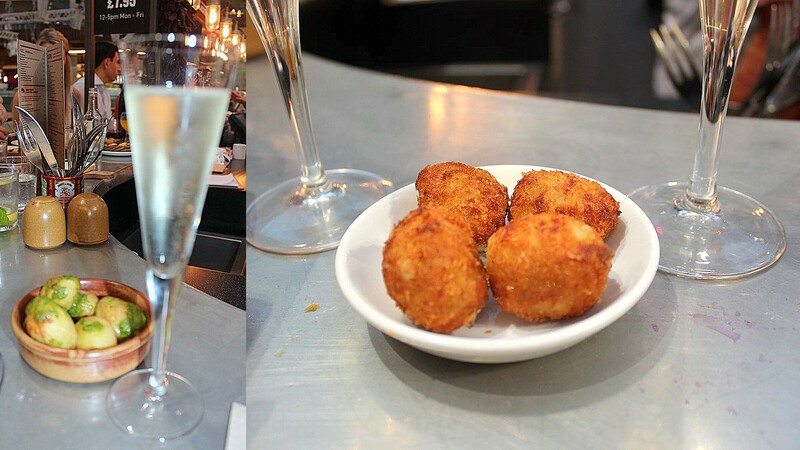 Croquetas de jamón – deeped-fried Iberico ham croquettes, these look innocent but are little parcles of delight as they go from cripsy to gooey soft full throttle taste machines as you bite into them,Advance Warning – Seriously addictive and I did try and steal more than my share from the sharing platter ….obviously Unsuccesfull and a bit let down, the crew wouldn’t have it, so they served me some Cava!! 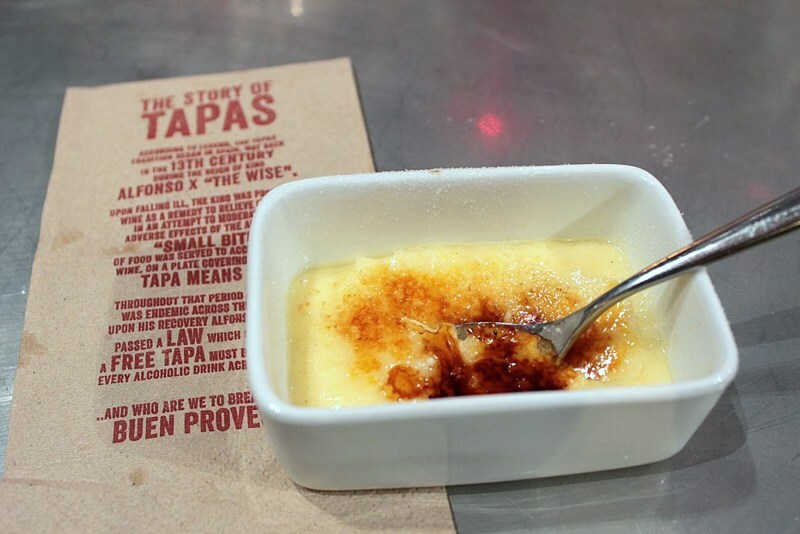 Oh wait, just when I was about to put my camera away, we were served Crema Catalana – Catalonian Custard Pots and Churros con Chocolate.OMG! Those custard pots are bits of perfection with a crunchy caramelised top and a creamy smooth custard with hints of vanilla. 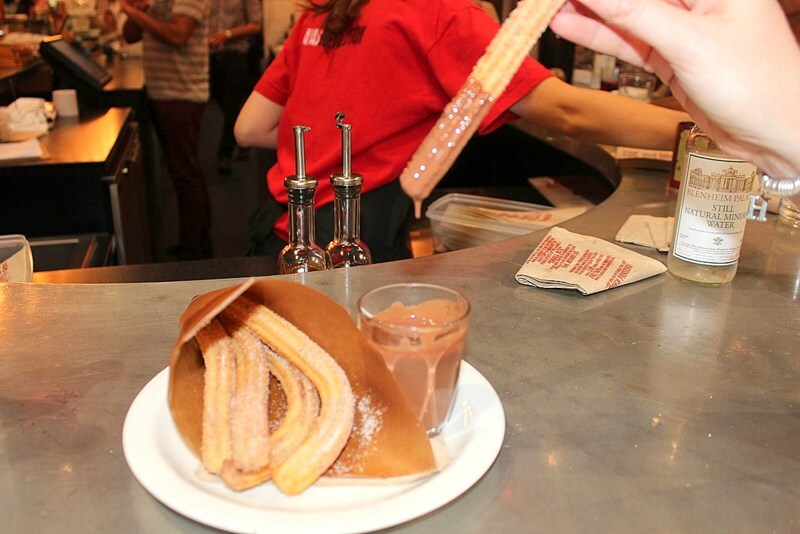 And those Churros….oooooo, instantly transported me to sunny shores on a perfect summers day.It took all of me to resist not dipping my finger into the liquid chocolate. 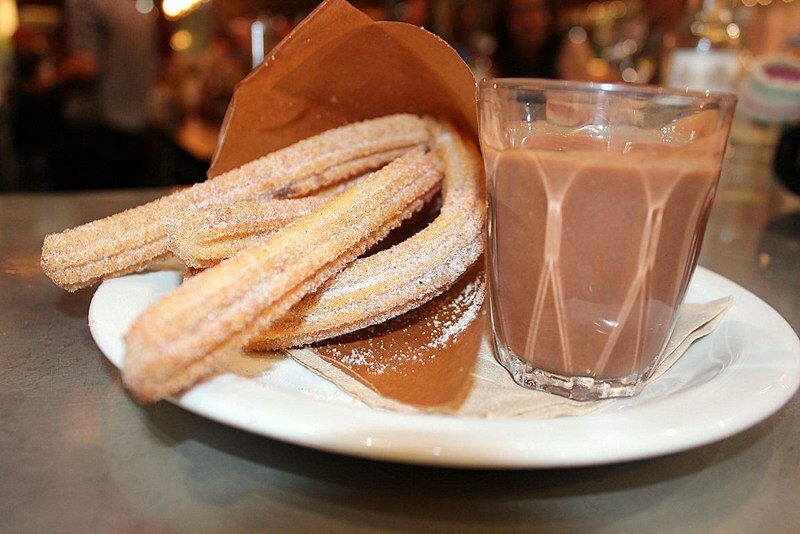 Helen,thanks for patiently letting me attempt clicking a picture of the Churros dripping chocolate while Chef Omar urged us to give the churros a generous dunk into this brown liquid goodness. 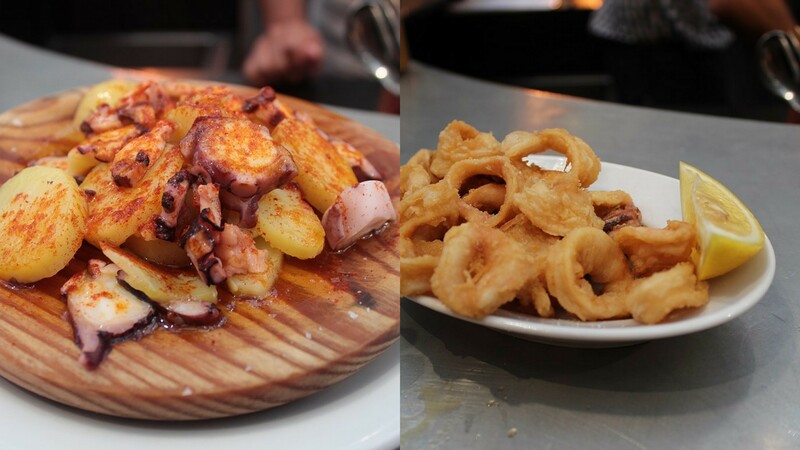 First Time I dared eat Octopus Yeah! 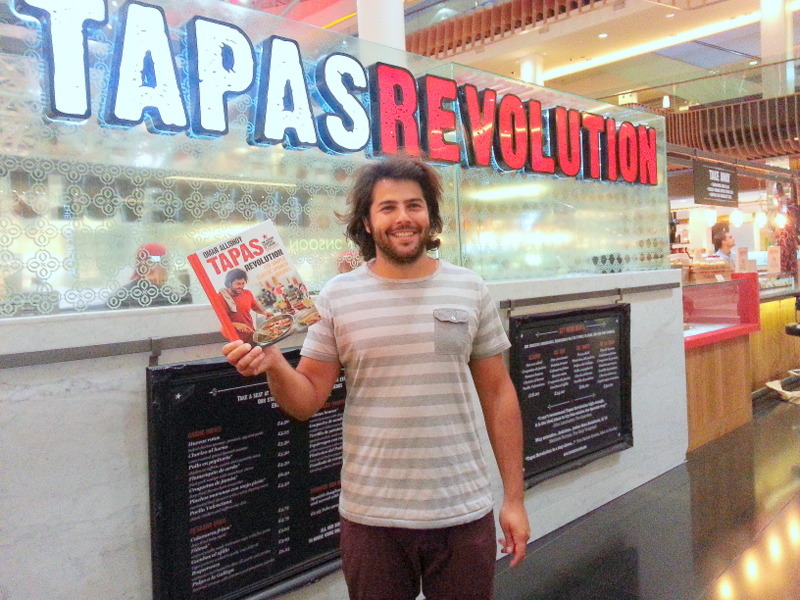 Armed with a signed copy of Chef Omar Allibhoy’s wonderful new book – TAPAS REVOLUTION (with food pictures that give me weak knees) ,I am confident that even a novice like me can make a valiant attempt at dishing up some of the delightful tapas and learn some fun tricks along the way. 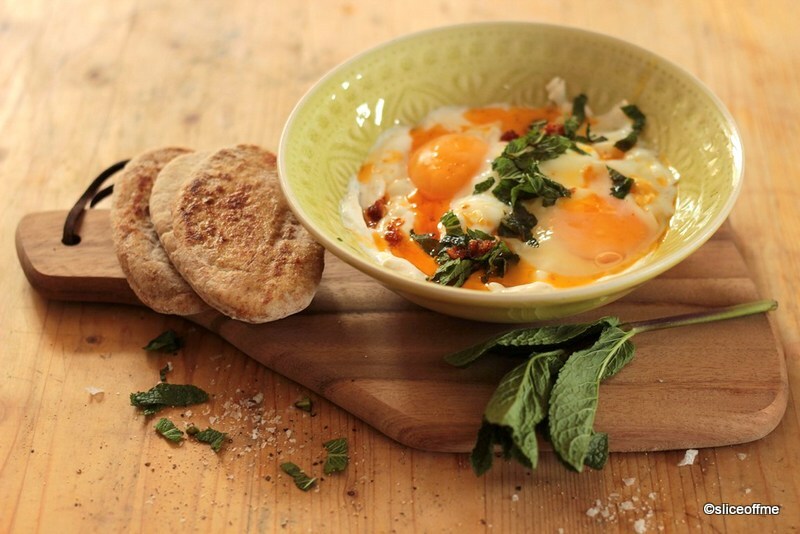 The beauty of the book lies in the fact that one can source these ingredients very easily in their local supermarket or simply raid their kitchen cupboards to create something absolutely wonderful. No fuss ,no do-dah. 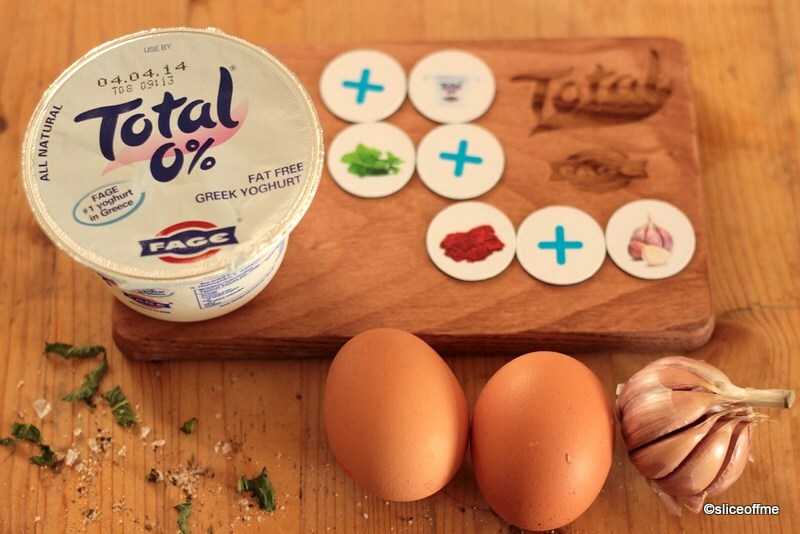 Just pure and simple Food – for each one of us to create a Revolution. Muchas Gracias to the organisers for inviting me to this wonderful evening of food, fun and tipples and watch the charming Chef Omar cook us Tapas! 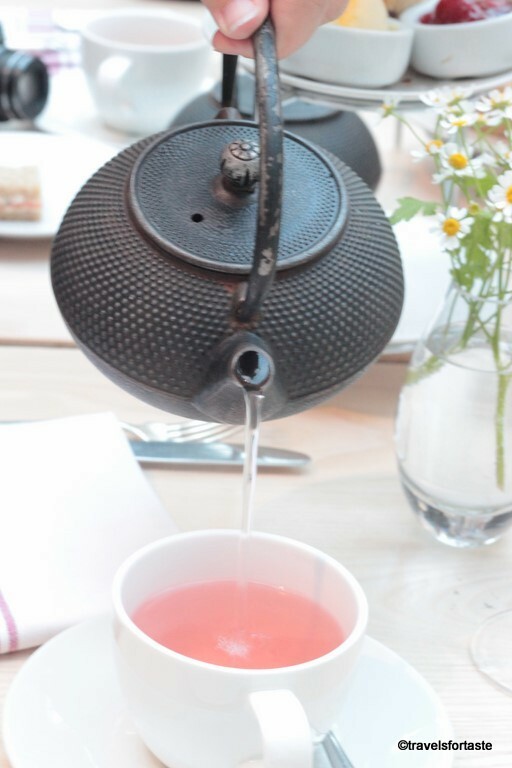 Well as my previous blog post mentioned I am quite besotted with my latest cookbook – The Vintage Tea Party by Angel. She is such a talented lady and anyone with orange hair,a vivid imagination, a vast collection of Vintage odds and ends and a great cook to top is all is my kind of hero! 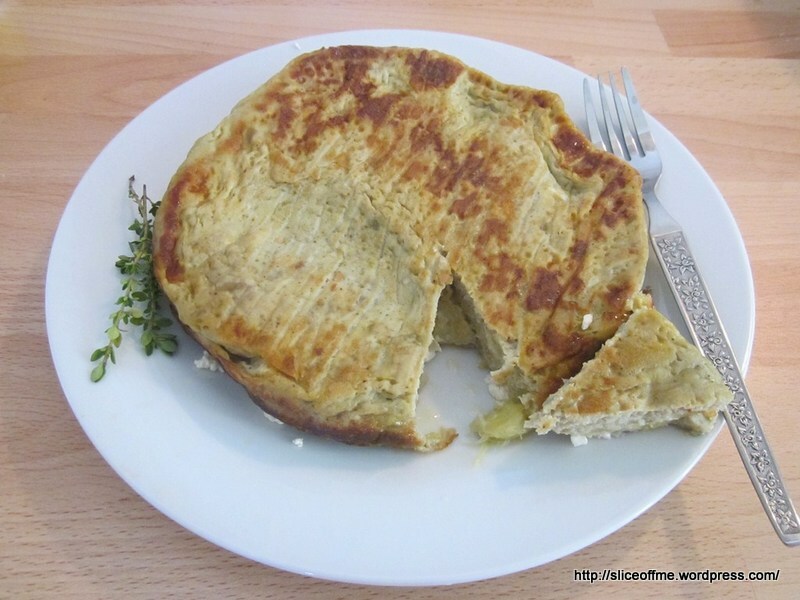 So I first ate a Frittata at my workplace where it was served during tea time,anything remotely associated with eggs and I simply must try it, I could live on fried eggs ,omelettes ,scrambled eggs and yes Frittatas! 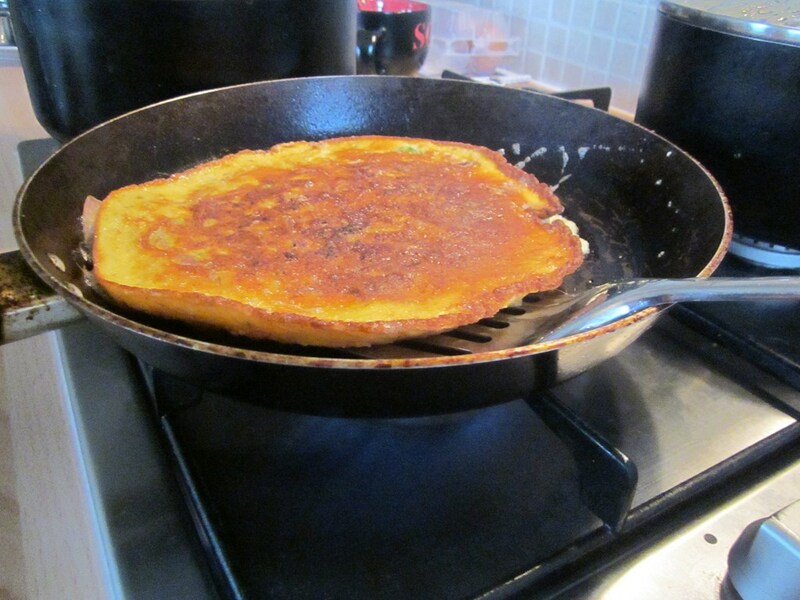 Wikipedia defines a Frittata as : The Italian word frittata derives from fritto, the past participle of “to fry” (friggere), and was originally a general term for cooking eggs in a skillet, anywhere on the spectrum from fried egg, through conventional omelette, to an Italian version of the Spanish tortilla de patatas, made with fried potato. 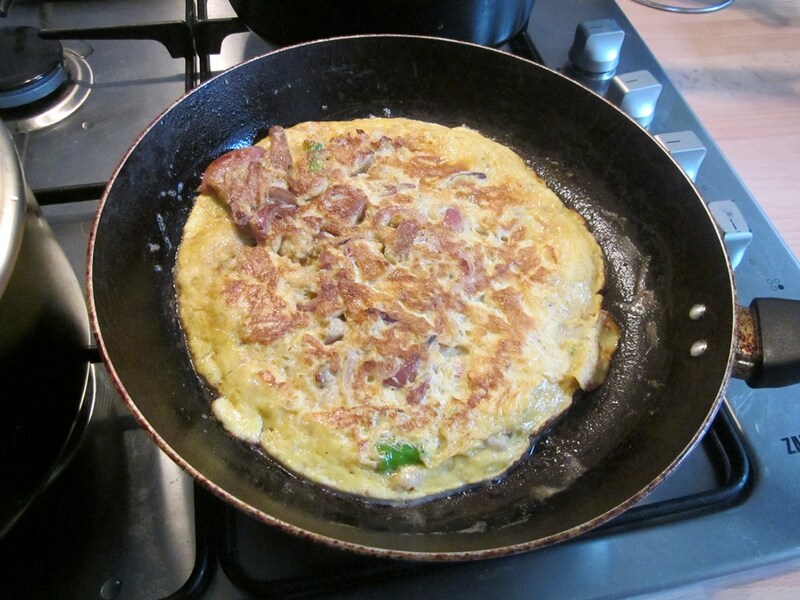 Outside Italy, frittata was seen as equivalent to “omelette” until at least the mid-1950s. Well,Angel’s recipe is an antithesis to this logic,why? well because it’s OVEN BAKED not fried and secondly is rather basic yet tasty,her recipe recommends using flower petals to decorate and also cutting it into shapes to make it more visually delightful and intriguing. Ofcourse what I’ve cooked isn’t a patch on the beautiful Angel’s creation but it’s a sort of a tribute to her, in a demi god,fan like behaviour sort of a way…!! By all means if any one of you does create one anything close to Angel’s original, please do share your feedback and pictures ! I have scaled down the ingredients for 2 people and added a few twists here and there for experimental touches of my own! Ingredient list to whip up a mean frittata- Vintage and all that 🙂 remember to roll up ur hair in a bun while making it and think Vintage :),Angel style ! Pre Heat the oven to 220° C /Fan 200° C/ Gas mark 7. Line a baking tin with non-stick baking paper. Heat oil in a small frying pan and fry the onions until soft for about 2 minutes, stir in the chopped courgette bits,fry on a higher flame for about 4 minutes till it’s goldenish. Angel advises not stirring or tossing this too much in her book and I do agree. 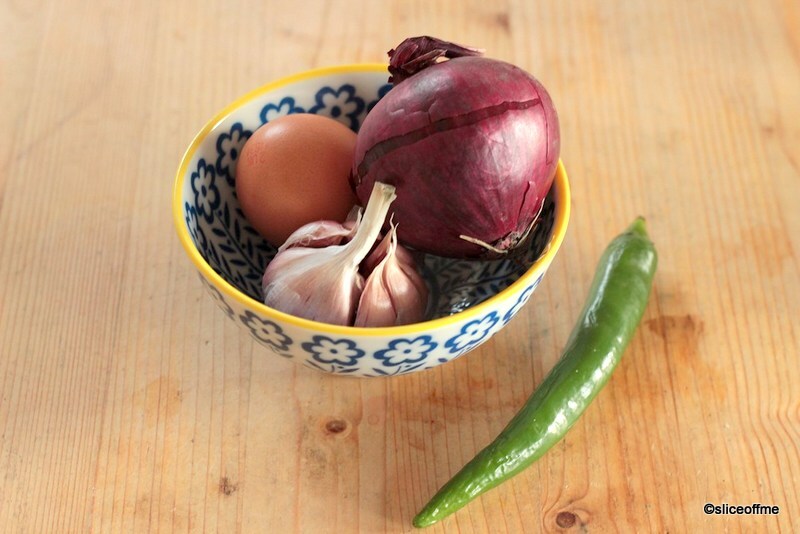 Beat eggs in a bowl,season with salt and add the onion and courgette mixture. 4. Crumble some goats cheese and then transfer above mixture to a baking tin of your choice, I simply used my small cake tin. Bake for about 15 minutes. Cool on a wire rack and serve hot.Season with cracked black pepper sprinkled on top. 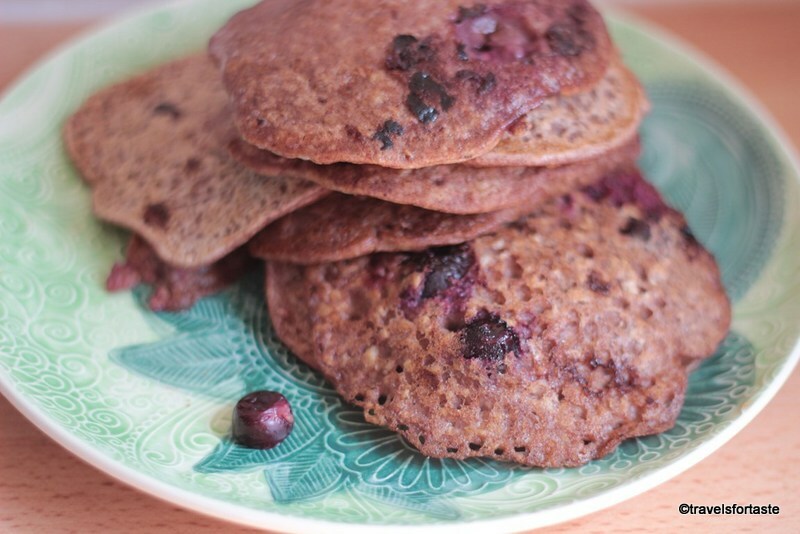 I think this makes for a really delicious and filling tea time snack and is really easy to make when time is a constraint,which is almost always in our busy lives. Of course,Angel’s recipe differs and requires some more cooking as there is cheese and is seasoned with edible gerbera petals, I will try it once am able to lay my hands on those delicate beauties. Trust if me if you already haven’t, her books are a MUST HAVE in everyone’s personal collection of recipe books, I for one am totally smitten! What better way to celebrate a new FOODISTA Badge for my post on Shahi Khichadi than by baking a chocolate cake , I firmly believe that chocolate is the one word that instantly lifts sagging spirits and the whole baking process itself is cathartic ! So sistah’s lets BAKE ! Chocolate for adding chocolate shavings,or crunchy choco balls or FRESH strawberries sliced – whatever suits your mood , mine says GO ALL OUT FOR CHOCOLATE ! 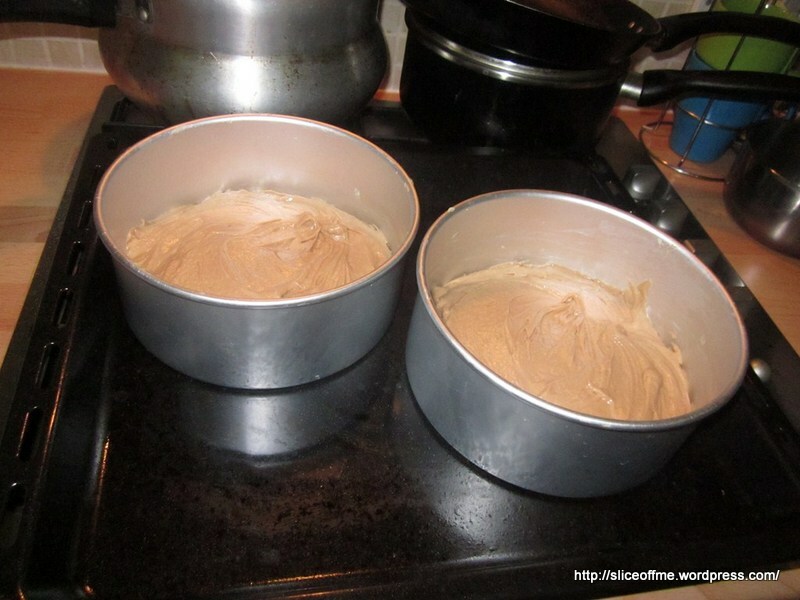 Lightly Grease two cake tins and line the bottoms with non stick-parchment. Perheat Oven to 180C/350F/Gas 4. I manage without parchment , it’s up to you, if your baking for the first time use it as it prevents the sides from burning. 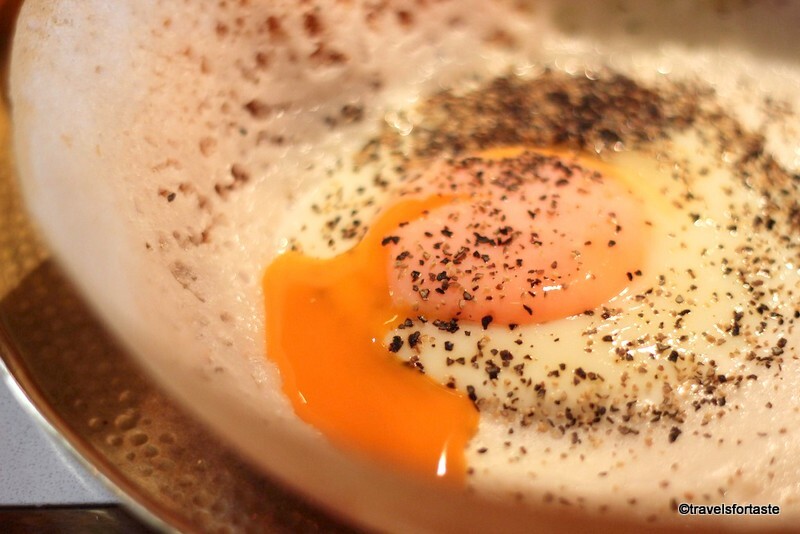 Add 3 medium or 4 small eggs, I used 3 medium-sized eggs. Swift the self-raising flour into this mix ,followed by the baking powder, soda bicarbonate ,cocoa powder and beat till really smooth , I didn’t even need a hand blender as the butter was perfectly soft and the flour well swifted , though do go ahead and use a hand blender on low setting for about a minute , have added a picture so you know the look of consistency. 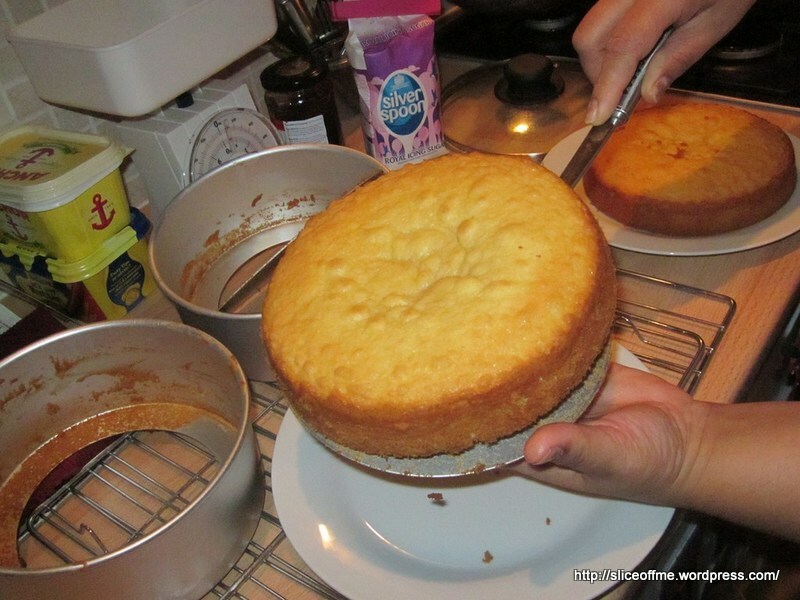 Divide the mixture between the two tins and put into the oven to bake for 25-30mins.I used the foil of the butter packaging to grease the cake tins, no wastage in my kitchen ! 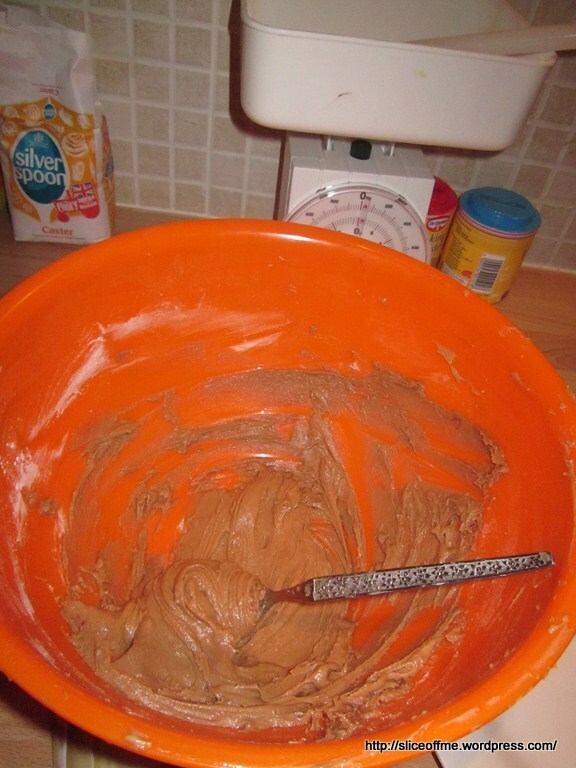 While in the oven make the icing by creaming together the butter and icing sugar and add cocoa powder, mix until smooth. Sandwich together the two cakes with the icing.Add some on the sides and sprinkle the crunchy choco balls on the top , go all crazy and add some chocolate shavings , I did !